I’ve gotten emails asking for a pattern… so I made one and you can get the PDF pattern in my shop or at my Craftsy shop. Though I didn’t make a sample, Jackie gave me a great idea to make one dipped in chocolate - so the pattern has a template for chocolate too. Zero fat… zero calories, enjoy! Hey, did you get an overwhelming response to make ME ONE??? LOL!!!! Thanks for the pattern Monica. It really is cute. Thank you! Can you guess what I’m doing tonight? Thank you, maybe this is the answer to never being able to find a needle when I want one, as well as finding them where I don’t want them. Oh, I received my Fat Quarter Fun book in the mail today. Thank you! It’s great. Please tell Karen thank you too. Thank you, Ms M, you are just TOO MUCH! Yep, it doesn’t like my little characters of “less than” and “numeral 3″ which were supposed to look like a sideways heart. Oh well, I tried. Sorry. Thank you so much for the pattern. Love it! And you! “All very low tech”??? Looks pretty cool to me — I wish I could do your version of low tech. My version of low tech is draw it out on a piece of paper and scan it! Your low tech is my high tech LOL! Thanks for the pattern — you’re a sweetie! It’s a wonderful project and sharing the pattern is a very generous gift for all of us. Thank you! How sweet and nice of you. Its darling. Thanks for sharing the pattern, you are very generous. Your needlebook are so cute and delicious!!! Thanks for the kudos!! I am so glad that you designed the chocolate dip…YUM!! You are an extraordinary person, as computer techie and crafter!! Thank you for doing this for us! It is adorable, and so are YOU!!! I heart you muchly!! Thank you so much for the pattern. I have never really wanted a needle case until now! 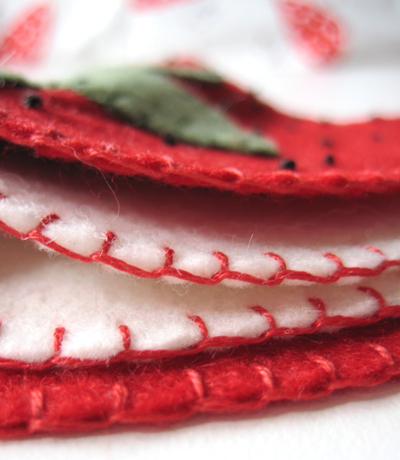 thanks for the pattern….this will make a great little gift for some quilty friends. Thank you sooooo much! How adorable! And I will be making mine with chocolate…or eating chocolate while I make it….yeah…somethin’ like that. 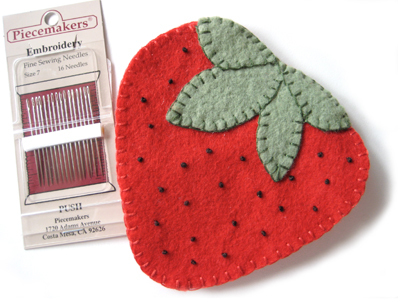 Everyone (including me) loves summer strawberries and felt craft stuff! It’s so cute! Thanks for this oh so adorable pattern! I made a felt strawberry and used a green and white gingham to make the leaves. 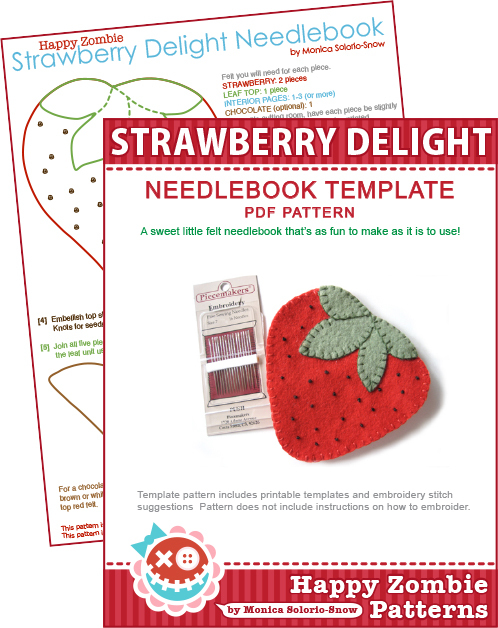 Thanks for the adorable strawberry needlecase pattern. I’ve got the perfect wool for this project! Thanks this is gorgeous. I LOVE strawberries! I love this new strawberry pattern! I am going to have to call the store again and have them send wool too. Well sort of. Neat blog. Thanks, I’ll be back.